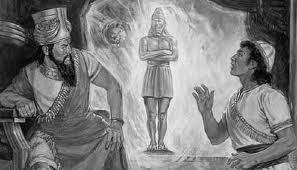 LESSON III - NEBUCHADNEZZAR'S DREAM. - Daniel 2: 31-49. Lessons From the Book of Daniel LESSON III – NEBUCHADNEZZAR’S DREAM. – Daniel 2: 31-49. LESSON III – NEBUCHADNEZZAR’S DREAM. – Daniel 2: 31-49. 1. WHAT did Daniel say the king saw in his dream? Verse 31. 2. What was its appearance? 4. What did the king see besides the great image? Verse 34. 5. What did the stone do to the image, and with what result? Verses 34, 35. 8. What did he say of the kingdom which should arise after him? Verse 39. 9. What is said of the third kingdom? 10. What is said of the fourth? Verse 40. 12. What else is represented by the iron and clay of the toes? Verse 42. 15. What is said of this kingdom? Verse 45. 16. By what is it represented in the king’s dream? 17. For what purpose was it given? 18. What is said of the dream and its interpretation? 19. What effect did the telling and interpreting of the dream have upon the king? Verse 46. 20. What did he say to Daniel? Verse 47. 21. How did he honor him? Verse 48. 22. What position did the king give to Daniel’s companions? Verse 49. 1. FROM gold to iron and clay shows a great deterioration in value and quality. This clearly proves decline and degeneracy of nations and the race, instead of improvement and growth to a golden age of peace and righteousness, which many so fondly cherish. 2. THE stone, which represents the kingdom of G-od, destroys all earthly governments, It does not convert and absorb them; it smites them, and they are broken in pieces. See also Ps. 2:8,9. Then the stone occupies all the territory, and “fills the whole earth.” “All things that offend, and them which do iniquity” having been gathered out of the kingdom (referring to the territory, see Matt. 13 : 41), it, the territory of these earthly kingdoms, not the people, becomes the kingdom of our Lord Jesus Christ (Rev. 11:15). It should be noticed that the stone smites the image on the feet, which were not developed till over 300 years after Christ came; hence the kingdom of God was not set up at His first advent. 3. “Thou art this head of gold.” That is, Babylon, the kingdom of which he stood at the head and representative, was the head of gold. The different divisions of the image represent the kingdoms which were to follow each other in the supremacy of the world. This is clearly shown by verses 39 and 40, and all students of history know that from Daniel’s time these kingdoms were Babylon, Medo-Persia, Grecia, and Borne; hence these kingdoms were symbolized by the gold, the silver, the brass, and the iron of the great metallic image. 4. IT should be noted here that the division of the fourth kingdom (Rome) is not based on the fact that there are feet and toes (and naturally ten toes, which might indicate ten divisions of the kingdom), but that the feet and toes are part of potter’s clay and part of iron. The scripture says, “Whereas thou sawest the feet and toes, part of potter’s clay, and part of iron, the kingdom shall be divided.” The division is indicated by the iron and clay and not by the toes. Hence in this scripture the division of the Roman Kingdom is symbolized, but not the number of the divisions. The division of Borne into ten parts is clearly shown in Daniel’7 and in the Revelation by the ten horns of the beasts, which symbolize Koine. Revelation 13 and 17. 6. THE kingdom of God must exist with power to overthrow all earthly governments before it smites them and breaks them in pieces, as taught in the prophecy. Christ is crowned King and receives His kingdom before He comes again to the earth. Luke 19 :12-15. When He comes He will wear a golden crown (Rev. 14 :14). and on His vesture a name is written. “KING OP KINGS. AND LORD OF LORDS” (Rev. 19:10). He will then gather the subjects of His kingdom (Matt. 24 : 30.31). and when the territory is cleared (Matt. 13 : 41; Dan. 2 : 34, 35), then the stone, or kingdom of God will become a great mountain and fill the whole earth. Thus the kingdom is set up and fully established by a succession of events. The king, capital, subjects, and territory will be brought into harmonious relations.